"Closing the interview is sure not advice you see every day. But I listened to the podcast and tried it in my interview and it was fantastic!" Closing for the job will dramatically boost your chances of getting the offer. The job interview is a sales process, no matter what you do for a living. You are selling yourself as the product they need. 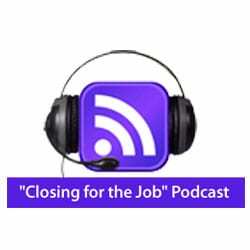 This podcast will help you develop the “sales skills” to complete the process, close the deal and get the job.